Deciding which path to take when hiking on Drummond Island feels like a choose-your-own-adventure story. Our hiking options are limitless and the path you choose will always be the right one. For those looking for tree canopied lanes or a robust hike through state lands, we have it. Drummond Island has four established hiking trails. Free detailed maps are available at the Visitor’s Center. 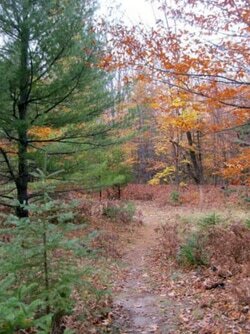 The Heritage Trail is a 3.0 mile nature hiking and snowshoe trail located at the Drummond Island Township Park. It provides a unique experience for birding, hiking or geocaching in the warmer months and snowshoeing in winter. There is great variety for a trail of this size. The Lower Level leads you through beautiful woodlands as it travels to the rocky beaches that define the Drummond Island shoreline. Trail use is free. The varied forest terrain and location on the shore of Potagannissing Bay bring many different habitats together in a small geographical area. 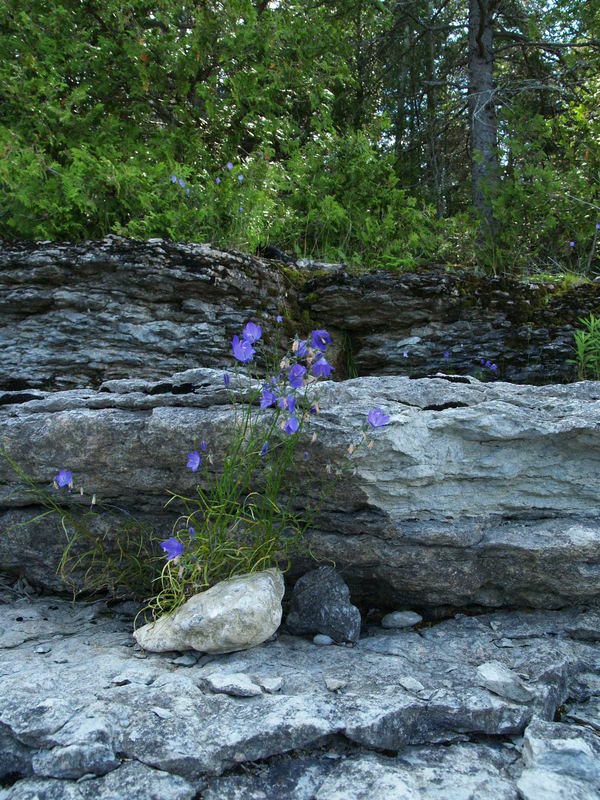 Flora lovers will enjoy the woodland flowers that mark the inner trial system and are seen in great numbers in the small natural forest openings. Traveling through many habitats, the trail is rich in woodland wildlife in every season. Look for whitetail deer and signs of other animals on your hike. Watch for forest birds along the trail, and waterfowl and loons on the bay. The trail-head is located on the park entrance road, 0.3 miles from M134. Parking is available at the trail-head. Bathroom facilities are available at the Township Park in summer months. The trail is marked with wooden directional signs and “You Are Here” location maps. The majority of the trail can be hiked or snow-shoed easily by the novice. 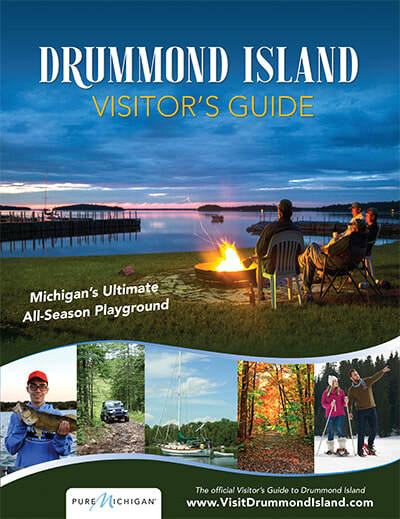 Trail maps are available at the trail-head and at the Drummond Island Tourism Association (DITA) office. The trail, owned by the Little Traverse Conservancy, opened in late summer 2008. Its trail head is located on the east corner of the Maxton, Tourist Road intersection. A parking area is provided and it’s close proximity to Drummond's main lodging complexes should make this a popular trail. 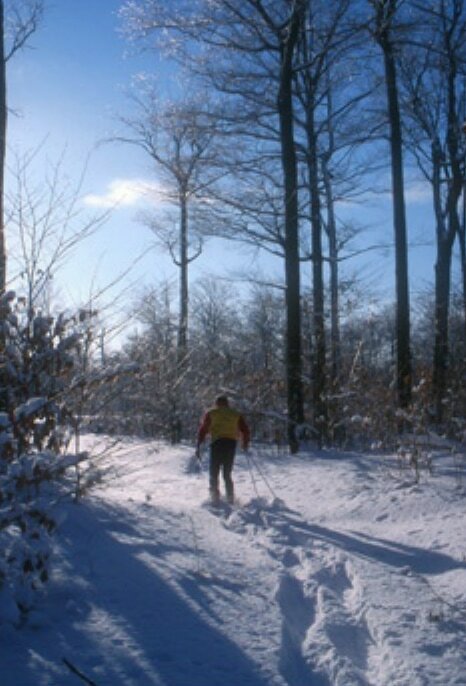 The Rainbow Cross Country Trail offers groomed cross country skiing in winter (only skiing, no snowshoeing, no trail fees) and hiking and birding in the non winter months. Located on state land on the Maxton Cross Road, this trail is 5.0 miles long. Short trail segments interconnect several loops, making it easy to return to the trail-head for shorter excursions or provide variety for extended trips. Laid out over rolling terrain, through open spaces and hardwood forest, there is a mix of sun and shade. The contour varies from very even to mildly uneven. Outdoor enthusiasts, nature lovers and birders will enjoy the wealth of flora and fauna indigenous to this region. The changing terrain of canopied forest, open fields and an inland lake provide a variety of habitats shifting in every season. The trailhead is located on the west side of Maxton Cross Road, 0.2 miles south of the intersection of Maxton Cross Road and Maxton Road. Parking is available at the trailhead. Bathroom facilities are not available at the trail but are available nearby. The trail is well marked with “You Are Here” location maps. Additionally, the Island features 117 miles of state land off-road vehicle trails. They purport to be potentially hikeable although these trails are described as demanding for off-road vehicles and are extremely rugged in areas. The snowmobile trail system grooms a total of 68 miles, 45 miles of which are state owned. The percentage of the snowmobile trail that is accessible to the public on foot is not known due to this trail system being contiguous with and often only accessible through private property. For information about longer trails and spectacular vistas, stop and ask at the Visitor’s Center. 1 and 2.5 mile hiking trails. 15 miles of groomed CCX ski trails.